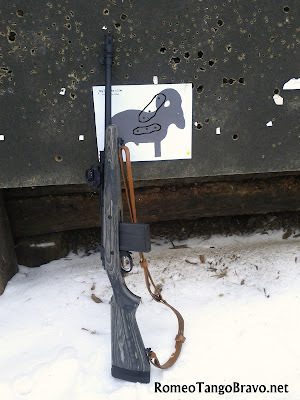 The Ruger Gunsite Scout rifle is quickly becoming one of my most favorite guns to shoot. It is compact, fairly light, and quick. I have outfit mine with a Bushnell TRS-25 Red Dot mounted on the forward picatinny rail. Firing from a seated position; using sandbags as a rest, I placed a target at 100 yards. I chose to use a Goat Target from MyTargets.com just for fun. At 100 yards the "3 M.O.A." dot covered the majority of the target as I fired. In the picture above I fired two three round groups with a slight adjustment after the first group. I was firing 150 Grain Federal Power-Shok fed into the rifle through the provided 10 round magazine. Overall, I am pleased with the accuracy from a forward mounted red dot. I have no doubt that even more accuracy could be squeezed out of this rifle with the use of a magnified optic. Now I need to get my hands on the polymer magazines.